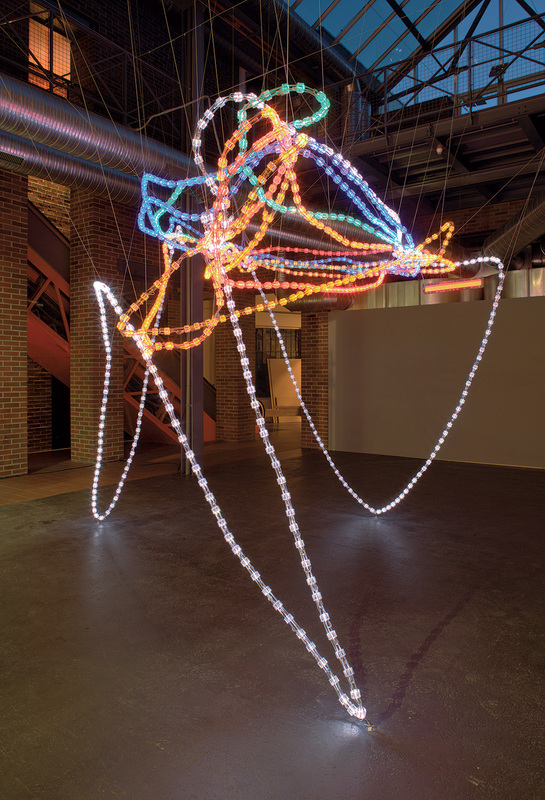 Plastic trade-off is a light sculpture as well as a virtual knowledge space. It visualizes global financial markets and thus a core element of global economy. The real-time data of specific markets are translated into abstract light flows which reflect this global system in a dynamic work of art. Plastic Trade-off can be described as a “tableau artificiel-vivant,” alive like a cyborg, artificial like a city. It resembles a living organism, or rather, societies of living organisms that move, manifest, exchange, and reproduce. It oscillates among information, transactions, transformations, institutions and the cyberspace. Plastic Trade-off undertakes a visual approximation of the volatile rhythms of financial markets and their diverse contexts and dependencies. The project traces in real-time the social life of (im)material values that do not originate from the liberal notion of a single market but arise from a fabric whose historic development spans modernity by way of incorporating a net of constantly growing global penetration, expansion, colonization, sophistication, and virtualization. Plastic Trade-off goes beyond representation; it is not purely symbolic: it is the global financial market in real-time, visualizing its constructed territory as a medium of world- and value production whose antithesis is also rendered visible in the enormous voids between the nodes and spaces it occupies. A semi-transparent cluster-fetish, it creates in flashing emulation a social creature of communication, a virtual medium of market valuation. Plastic Trade-off sheds light on the inherent ambiguity: it reveals the affirmative potential of a “market moneyfesto” and at the same time is a critical emblem of capitalist exploitation. In the process of conceptualizing an artwork on global financial markets, complex questions arise on a variety of topics of an economic, social, political, cultural and artistic nature. These include issues related to the visualization of the economic system in its currently paradigmatic implementation of media-technological financial markets; regarding the logistics of global distribution as well as distributional justice; social changes and developments due to capital’s claims for constant liquidity and thus the issue of its biopolitical power; the dissolution of proximity and distance in the virtual space of trading without equivalent on site; current counter-emancipatory forms of colonialism; but also liberating potentials that offer new possibilities and approaches of resistance; and finally, the question of how to approach the realization of such a project artistically. Subsequently, the major exchange places, markets, and influential international institutions were defined. The resulting global map was imported into a 3D-software, and the places were then connected in relation to the markets. What resulted was a 3D-visualisation of the global financial system. The underlying “globe” of the virtual 3D-model was deleted and what remained was the sculptural framework of Plastic Trade-off. Finally, an exact miniature was 3D-printed that served as the architectural template for the construction of the light sculpture. Plastic Trade-off was realized in 2006 as a permanent installation for WORKING–WORLD.NET, Working and Living in Globalization, Museum Arbeitswelt, Steyr, Austria. Additional credits: Light engineering: LDDE Vertriebs GmbH | Technical assistance: Thomas Sandri. Technik für Kunstwerke | Interface programming: Matthias Strohmaier | Real-time financial market data supplied by: TeleTrader Software AG, Scientific explanations (posters accompanying the artwork): Beat Weber. Specifications: Size: 370 x 400 x 380 cm, Weight: approx. 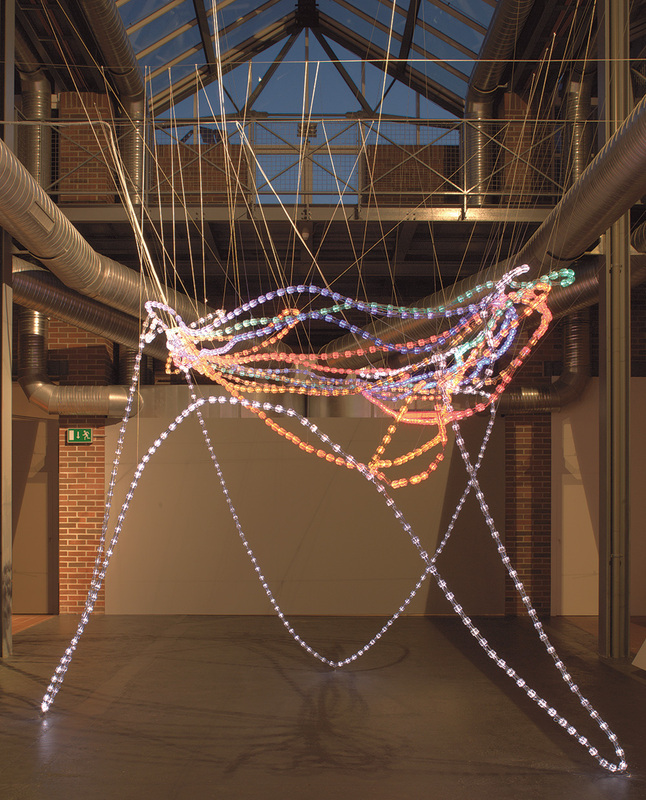 60 kg, 7 light strings composed of 1500 LEDs in different colors, mounted inside acrylic glass discs, 4 light strings with flashing lights running in both directions with variable speeds, 2 light strings, pulsating, 1 with variable speed, 1 light string, static light, Structural framework and data/power lines (4mm insulated copper wire) are identical. Steel wire suspended and fixed the construction. Computer engineering: real-time market data are imported from the Internet through the API (Application Programming Interface) of a market data provider into a customized program which analyses the data according to market affiliation and movement. The market data movements are assigned to scales of values corresponding to the markets/light strings. These constantly updated values are transported to DMX software that assigns speed and direction. Via DMX boxes the data are transported to the corresponding light strings.